Music by Eartha Kitt, Harry Fontenot and Gustav Mahler sung by Kahleen Ferrier. 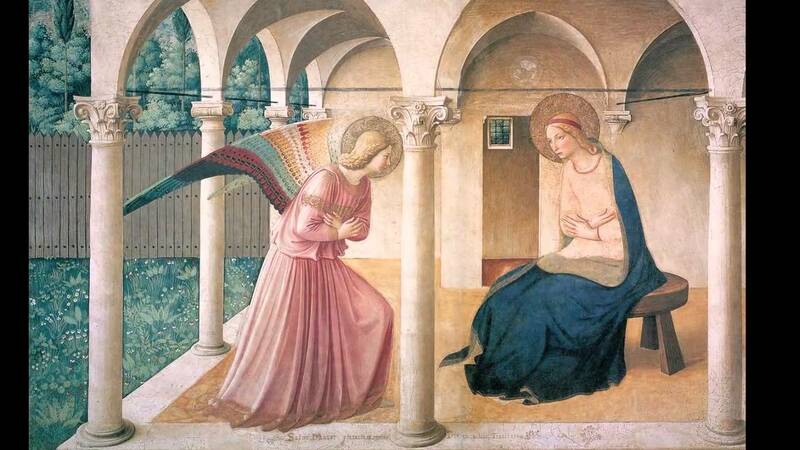 Today’s painting by Fra Angelico has long haunted my imagination since I first saw it in The Convent of San Marco in Florence. Our sleigh moves on from yesterday sliding us forward on our Christmas journey. Today we start with a song from an authentic show business legend – Miss Eartha Kitt and her classic, slinkily sensuous 1953 recording, ‘Santa Baby’. Eartha performs the Springer brothers and Joan Javitt’s song in her trademark knowing style. As the song progresses Eartha makes a series of increasingly outrageous demands on Santa’s generosity. All she wants is a sable, a convertible (light blue), a yacht, the deed to a platinum mine (gold being so common), a duplex, Tiffany jewellery and a ring (64 carat for sure). Eartha’s vocal here supported by Henri Rene and his orchestra is a study in practiced come hither allure. The cynical lyric is caressed as she reels in our attention. Seeing her perform the song live is to see a siren setting a song ablaze with the flames licking around the mesmerised audience. Everything Eartha did carried a charge of the exotic – she looked, moved and spoke like no one else building on her black, Cherokee and White heritage and dance training to create a unique image that demanded the audience’s deference and worship. Orson Welles famously called her the most exciting woman in the world and while others of her era like Marilyn Monroe and Elizabeth Taylor might have taken issue with that claim they too would surely have admired the sheer dramatic daring of Eartha’s regal performance of, ‘Santa Baby’. Come on Santa – hurry down the chimney and don’t forget the sable. Fr Josef Mohr wrote a poem in 1816 he called, ‘Stille Nacht’. Two years later on Christmas Eve 1818 with a midnight mass in prospect he decided to visit his friend Franz Gruber a choirmaster and organist to see if there was any chance of turning, ‘Stille Nacht’ from a poem into a carol to perform that night. Mohr had to walk several kilometres to se his friend who set to work with such vigour and inspiration that an arrangement for guitar and voice of, ‘Stille Nacht’ was ready as the two set off to Fr Mohr’s church in Oberndorf. So, in the cold of an Austrian night on Christmas Eve 1818 the carol, ‘Stille Nacht’ or, ‘Silent Night’ as it is known in the English speaking world was sung for the very first time. Neither of the writers or the congregation could possible have known that the heartfelt simplicity of, ‘Silent Night’ contained a spiritual power and attractiveness that would go on to make it perhaps the most loved of all church based Christmas songs. Congregations all over the world this Christmas Eve will echo the words and melody created nearly two hundred years ago and find that it’s magic never fades. There is no counting the number of versions available of, ‘Silent Night’. The one I have chosen to showcase here is by a gorgeous Cajun version by accordionist Harry Fontenot. I love the rustic simplicity of this version – it seems to me the kind of sound that would not have sounded out of place in a stable with animals and shepherds gathered around to witness an event that was at once entirely commonplace – the birth of a child. And yet all present had the sense that this birth was something very special that would remake the world for all eternity. ‘Silent Night, Holy Night, All is calm, all is bright ………. The poem providing our extract today is the short but immensely wise, ‘BC : AD’ by the much under rated U A Fanthorpe. This entry was posted in 1950s, 1960s, Cajun Music, Christmas, Classical Music, Music and tagged B.C. :A.D., Das Lied von Der Erde, Eartha Kitt, Fra Angelica Annunciation, Harry Fontenot, Kathleen Ferrier, Santa Baby, Silent Night, U A Fanthorpe by Thom Hickey. Bookmark the permalink. OMG, Eartha. Santa would have come down your chimney and never left! Yes any attempt to resist Eartha is doomed to failure! Another interesting selection – thank-you. I like U A Fanthorpe! UA is a wonderful poet much neglected apart from afficianados like me. A beautiful mix Thom – the painting is stunning and your gloss is absolutely right. Can there ever be a saucier song than Eartha’s version ? And ‘Das Lied’ and that Cajun accordion both, in their very different ways, find ‘the heart of the wud’. Been reading the text of ‘Das Lied’ and find some of the expressions come from Chinese sources! ‘Heart of the Wud’ – exactly! And you can arrive there from so many directions.